Dr Khetrapal Singh’s candidature was unopposed, as the 11 member countries of WHO South-East Asia Region met at the ongoing Regional Committee session to elect the next Regional Director. The leadership provided by Dr Poonam Khetrapal Singh has seen the WHO South-East Asia Region emerge as the top performer in the organization globally. Her commitment to the public health agenda in the Member States is reflected in the significant achievements in all the flagship priorities of the Region, he said. The Director-General said that through her flagship programmes, Dr Khetrapal Singh had brought a strong focus to delivering results in countries, which is one of the key themes of WHO’s new General Programme of Work and of WHO’s transformation project. 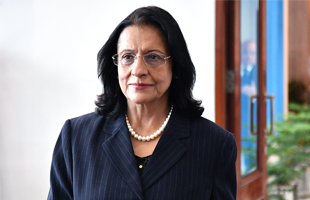 Thanking the Member States for nominating her for the second term, Dr Khetrapal Singh said, “my vision is to sustain, accelerate and innovate to further strengthen progress in the priority areas and translate vision into action”. Dr Khetrapal Singh has a long and distinguished career in public health of over four decades. She served in the health sector at various senior positions during her stint in the Indian Administrative Services; in the World Bank; was part of WHO Director-General’s cabinet in Geneva; worked as the Executive Director of Sustainable Development and Healthy Environments in WHO headquarters; and was Deputy Regional Director WHO South-East Asia Region from 2000-2013. Dr Khetrapal Singh’s ongoing first term as Regional Director began on 1 February 2014, during which, in consultation with the Member countries she identified seven flagship priorities -– achieving universal health coverage; strengthening emergency response capacity; reversing the noncommunicable disease epidemics; finishing off neglected tropical diseases; combatting antimicrobial resistance; preventing maternal, under-5 and neonatal deaths and eliminating measles and controlling rubella. Eliminating tuberculosis was added as her eighth flagship in 2017. Substantial progress has been made in each of these flagships and beyond. Certified polio free in 2014, the Region continues to maintain this status. The Region eliminated maternal and neonatal tetanus becoming only the second WHO Region to do so. Four countries in the Region have eliminated measles and six have controlled rubella. The maternal mortality rates in the Region have reduced by 69%, the steepest decline in any WHO Region during the MDG era. Countries in the Region have reduced maternal, under-5 and neonatal mortality rates to levels below the SDG targets. Among neglected tropical diseases, India eliminated yaws, Nepal eliminated trachoma, while Maldives, Sri Lanka and Thailand have eliminated lymphatic filariasis. Two countries – Maldives and Sri Lanka – have eliminated malaria. All countries are implementing national action plans to combat anti-microbial resistance. Nine of the 11 countries have multi-sectoral action plan to address non-communicable diseases while all countries are committed to 25% relative reduction in overall NCD mortality by 2025. Improved preparedness is helping minimize deaths and diseases during outbreaks and emergencies, while the South-East Asia Regional Health Emergency Fund continues to support emergency response, and now preparedness as well. In their quest to achieve universal health coverage, countries are increasing their health budgets, rolling out health financing programmes, strengthening health workforce and making efforts to make essential medicines accessible and affordable. The regional flagships are in sync with the Sustainable Development Goals 3 on health, and WHO’s new triple billion goals to promote health, keep the world safe and serve the vulnerable. As per WHO procedures, the WHO Executive Board, which next meets in Geneva in January 2019 is expected to confirm Dr Khetrapal Singh’s nomination and appoint her as the Regional Director. Dr Khetrapal Singh will commence her next five-year term on 1 February 2019.